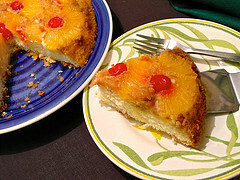 Bonnie Banters: Pineapple Upside-Down Cake ~ Simply Scrumptious! Pineapple Upside-Down Cake ~ Simply Scrumptious! 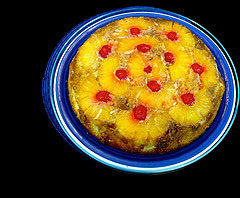 My daughter served this luscious pineapple upside-down cake this past holiday season; and when I took my first bite, I absolutely thought I was going to melt! I told you she had a talent for recognizing a good recipe...naturally, I had to have this one! Now, we all know the real beauty of an upside-down cake is how simple they are to make. But the topping on this cake is what makes it so special, and it's made a little differently than the typical topping for an upside-down cake. Spray the iron skillet well with the butter-flavored cooking spray. Whisk together in the skillet, over medium heat, the butter, cream or evaporated milk, brown sugar and ginger until the mixture bubbles. Whisk constantly about 3 more minutes, or until thick and smooth. Remove from the heat. Sprinkle the coconut evenly over the brown-sugar mixture. Beat the eggs until thick; then add the sugar a little at a time, mixing well. Stir the dry ingredients into the egg mixture just enough to incorporate. Set aside. In a small saucepan, whisk the milk and butter together over medium heat just until warm (about 1 minute)...stir into the batter and pour over the pineapple in the skillet. Bake approximately 40 minutes, or until the cake is golden brown, springs back when lightly touched in the center with your finger and an inserted toothpick comes out clean. Approximately 15 minutes after the cake is out of the oven, loosen the edges carefully from the pan with a thin-bladed knife; then let the cake cool about 1 hour total in the pan. Makes a great take-along dessert! Serve with or without a nice dollop of whipped cream beside each individual serving of cake. So, when you're pressed for time, but want something that everyone will exclaim "oh, that's so good! ", you'll definitely enjoy this recipe! Unsweetened coconut flakes should be fine. I found this link if you want to sweeten the coconut flakes: http://www.ehow.com/how_5104548_sweeten-unsweetened-coconut.html; however, before I would go to all that trouble for this recipe, I think I would either use the unsweetened or leave the coconut flakes off altogether since the topping is already sweet. Good luck...please let me know what you decide to do and how you like it! Thanks for your comment, and I'm sorry that this was the earliest I could reply...hope you still have time to make it! Thank you Bonnie, I used the plain coconut flakes & it was sensational. You were right as it was lovely & sweet but not overly so....not a crumb left lol. Thanks so much for letting us know that the plain coconut flakes worked, and I'm so glad you enjoyed the recipe!! @Kerry Hancock, Thanks to you, I've updated the recipe to specify sweetened or unsweetened coconut! Have a wonderful Sunday!